ArmInfo.Relatives of the policemen who were detained on suspicion of torture, blocked the route Yerevan-Sevan, demanding the release of police officers from custody. To negotiate with the rally at the place of action profits and. Deputy Prime Minister of Armenia Tigran Avinyan, Acting Hakob Arshakyan, Minister of Transport and Communications; and Gnel Sanosyan, Governor of Gegharkunik Province, and Agasi Kirakosyan, Deputy Head of the Police of Armenia. Relatives of the detainees claim that the police did not beat anyone. 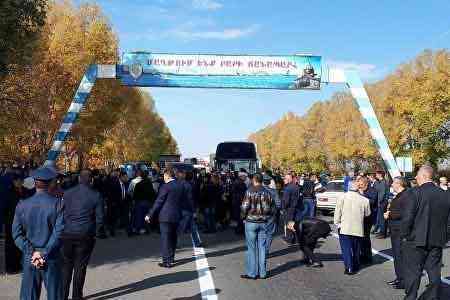 The authorities managed to convince the rally of the policemen’s relatives to unblock the Yerevan-Sevan highway. At the same time, they threatened to block the highway if the police were to be released from custody until the evening. Recall, in the framework of the criminal case initiated in the Special Investigation Service, the head of the criminal investigation department of the Sevan police and two operative officers of the same department were detained on suspicion of committing a crime, as provided in paragraph 4 of article 30.1.1 of the Armenian Criminal Code. They are accused of torturing citizen A.M. in a group. A.M. submitted a report to the Special Investigation Service that on October 7, 2018, three police officers took him to the police station from the territory of one of the bookmakers of Sevan, after which he was beaten. The investigation continues.